Simulation can be used to validate optical system designs with experimental data and theory. However, traditional simulation methods for optically large structures, where the geometry is much larger than the electromagnetic wavelength, can be computationally expensive and time consuming. 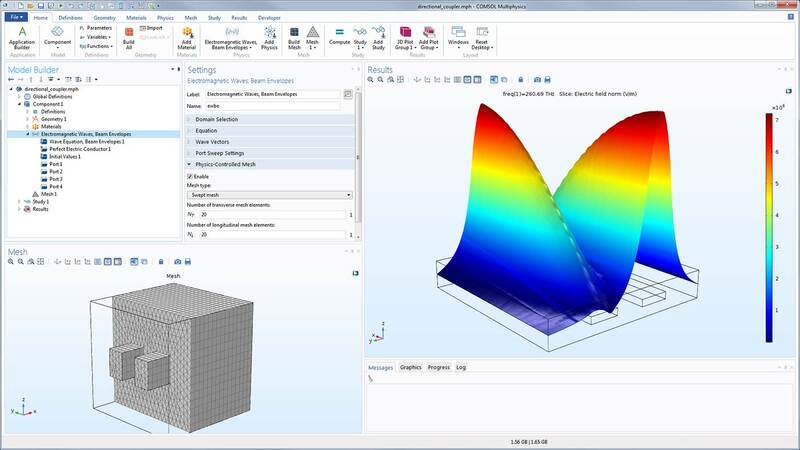 The Wave Optics Module, an add-on to the COMSOL Multiphysics® platform software, is an efficient choice for your optical modeling needs. The Wave Optics Module includes a specialized beam envelope method that can be used to simulate optically large devices with far fewer computational resources than traditional methods. There are features available for modeling optical systems, such as domain polarization, which is useful for nonlinear wave propagation. The material library includes dispersion relations for the refractive indices of more than 1400 materials, including a large number of glasses used for lenses, semiconductor materials, and in other areas. In order to optimize designs for photonic devices, integrated optics, optical waveguides, couplers, fiber optics, and more, you need to account for real-world scenarios. 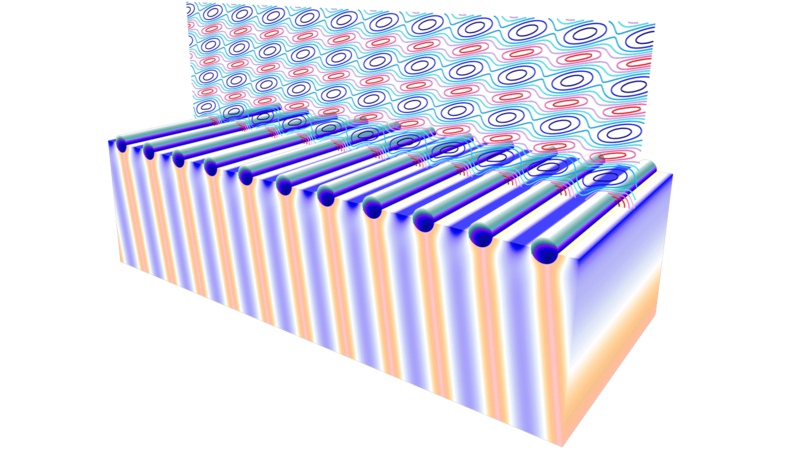 With the multiphysics modeling capabilities of the COMSOL® software, you can study how other physics affect optical structures; for instance, laser heating, carrier transport in semiconductors, and stress-optical effects. Wave optics requires a numerical method that can efficiently model and solve complex problems. The beam envelope method analyzes the slowly varying electric field envelope for optically large simulations without relying on traditional approximations. It requires much fewer mesh elements to resolve each propagating wave when compared to traditional methods. Did You Know? 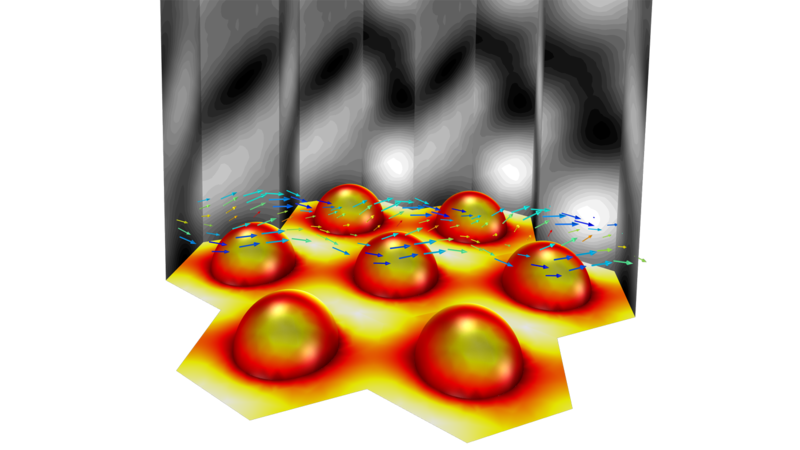 The beam envelope method is a simulation method for laser heating and accurately solves for fields and losses near the focus of the beam, when the heated domain is large in comparison to the wavelength. 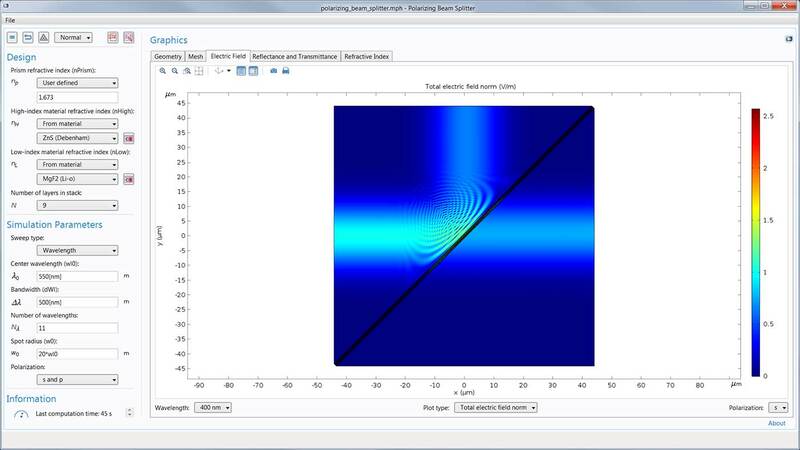 The beam envelope method is an efficient and reliable choice for wave optics simulations. Equally important, the Wave Optics Module offers a traditional full-wave propagation method that is based on direct discretization of Maxwell's equations. Both methods are based on the finite element method (FEM). 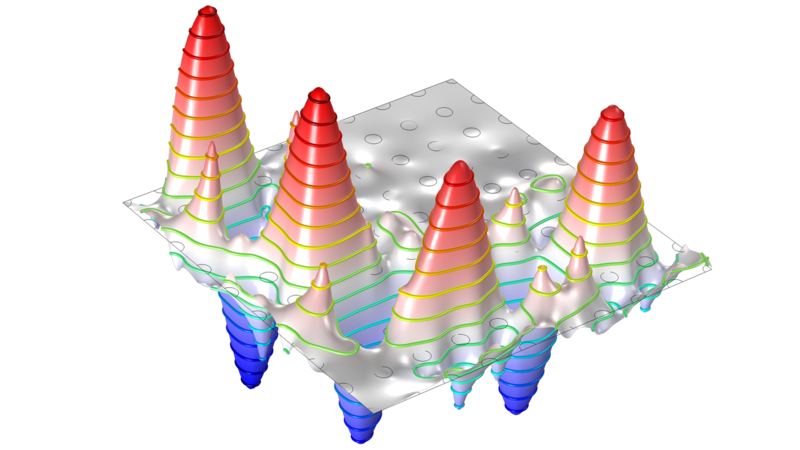 The Wave Optics Module provides features for specialized wave optics modeling when combined with the core functionality of the COMSOL Multiphysics® software platform. A photonic crystal waveguide, in which a photonic band gap is obtained so that only waves of a certain frequency range can propagate. Explore the features and functionality of the Wave Optics Module in more detail by expanding the sections below. The Wave Optics Module comes with a selection of predefined physics interfaces for modeling a wide range of micro- and nano-optical devices. You can also access the Semiconductor Optoelectronics, Beam Envelopes and the Semiconductor Optoelectronics, Frequency Domain interfaces by adding the Semiconductor Module. The electric field in a Fresnel lens calculated three different ways for verification: the Fresnel approximation, the built-in Electromagnetic Waves, Beam Envelopes physics interface, and the Electromagnetic Waves, Frequency Domain physics interface. The Wave Optics Module enables you to quickly and easily set up a model in 2D, 2D axisymmetric, and 3D domains. Both fundamental and advanced boundary conditions are included for your analyses. A hexagonal grating with half spheres reflects a plane wave in this scattering example model. The results include the ensuing electric field and the diffraction efficiency. Take full control over your simulation by modifying material definitions, the governing Maxwell's equations, or boundary conditions directly within the software. This flexibility enables you to create a variety of user-defined materials, including metamaterials, with engineered properties and gyromagnetic and chiral materials. Equation-based modeling makes it possible to customize the exact inputs and outputs needed for an optical simulation without relying on assumptions or approximations. The Wave Optics Module offers automatic mesh generation that resolves the wavelengths of electromagnetic phenomena under the hood via FEM in concert with state-of-the-art solvers. Several types of finite element mesh elements are available. Did You Know? If you have prior knowledge of the wave vector or phase function everywhere in your simulation, you can dramatically reduce the number of mesh elements needed to solve your model by using the beam envelope method. A directional coupler, formed by two side-by-side optical waveguides, is modeled with physics-controlled meshing using a swept mesh to determine the electric field norm. The Wave Optics Module includes a comprehensive selection of solvers and study types to find verified numerical solutions. Eigenfrequency, frequency-domain, wavelength-domain, and boundary mode analyses are also available. 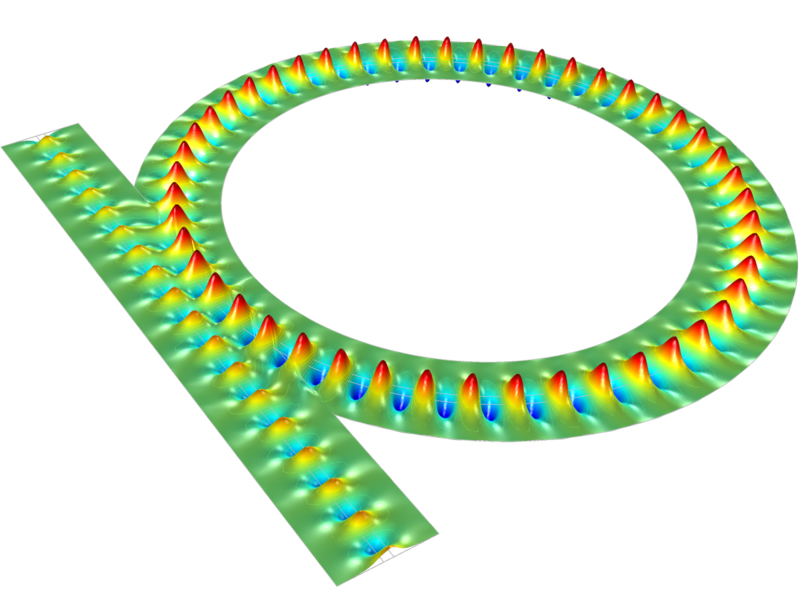 Two boundary mode analyses and a frequency-domain study are run to obtain the electric field and the reflectance, transmittance, and loss in this optical ring resonator. Present your simulation results in a format that is clear and easy to understand. The postprocessing tools included in the Wave Optics Module enable you to compute S-parameter matrices, transmission properties, reflection properties, and more. There are also advanced tools for visualizing and postprocessing arbitrary field quantities. A wire grating unit cell is modeled, where Floquet boundary conditions define the periodicity. The unit cell is multiplied to form a 3D object. The coefficients of transmission, reflection, and first-order diffraction are also computed. Think of the time and energy you would be able to devote to new projects if you did not have to run repetitious simulation tests for others on your team. With the Application Builder, you can build simulation applications, that further simplify the simulation workflow by enabling you to restrict the inputs and control the outputs of your model so that your colleagues can run their own analyses. 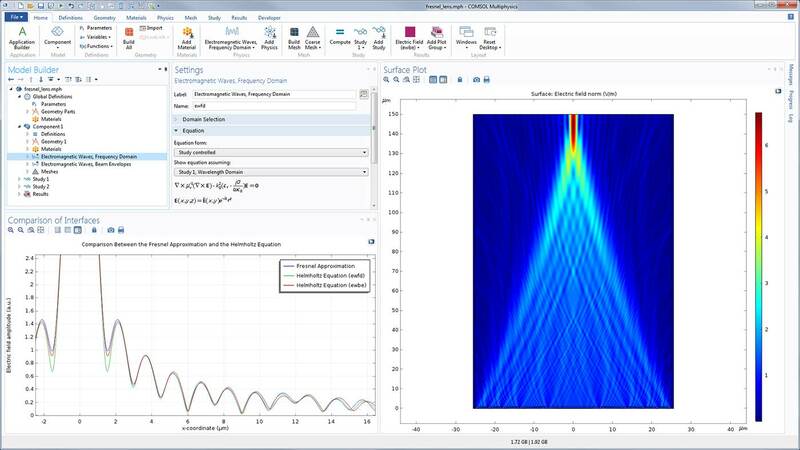 With applications, you can easily change a design parameter, such as wavelength in a component, and test it as many times as you need without having to rerun the entire simulation. You can use applications to run your own tests more quickly or distribute applications to other members of your team to run their own tests, further freeing up your time and resources. You can expand the capabilities of simulation throughout your team, organization, classroom, or customer or vendor base by building and using simulation applications. A Gaussian beam travels through two glass prisms, separated by a stack of alternating high and low refractive index materials. The wave is either reflected or not, depending on the design and simulation parameters chosen by the app user. If you want the design of your optical structure or device to operate in the real world, you need to examine how other types of physics affect it. 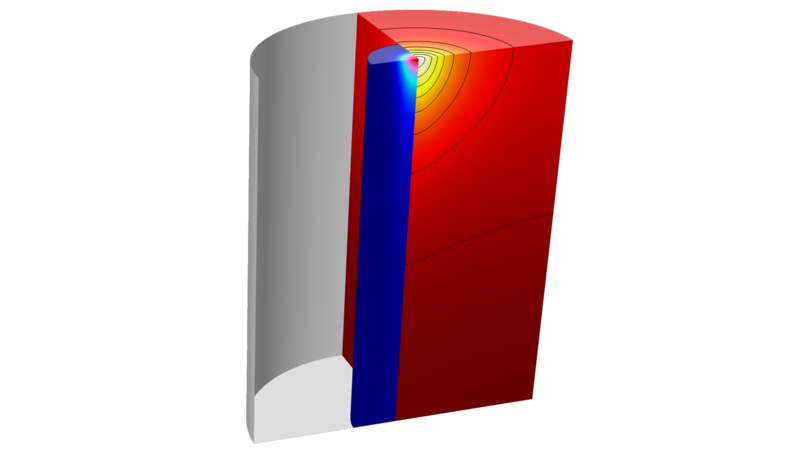 Easily couple different physical effects in one analysis with the COMSOL Multiphysics® software and the Wave Optics Module. Many wave optics applications involve multiple physics, including heat transfer in laser heating, structural mechanics in stress optics, and semiconductor lasers, to name a few. With multiphysics simulation, you can couple all of these physical effects into the same modeling environment for comprehensive simulation research. Is there another physics area affecting your end-product? 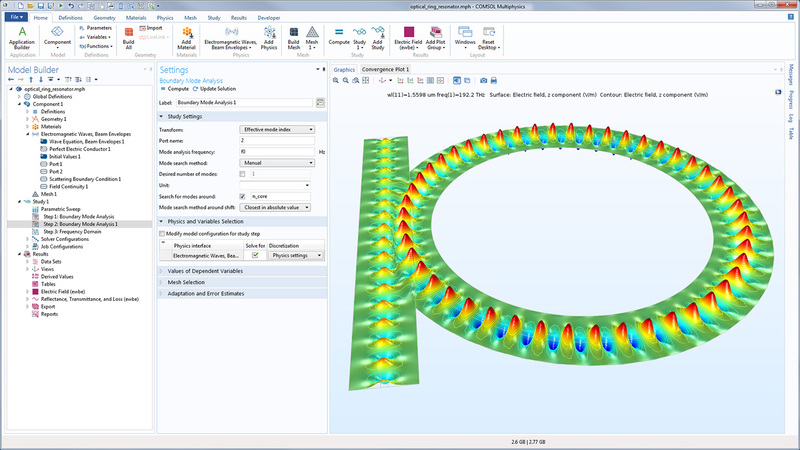 Mix and match the Wave Optics Module with any module you want, all of which seamlessly integrate with the core COMSOL Multiphysics® software platform. This means that your modeling workflow remains the same, regardless of the application area or physics you are modeling. Laser heating of a semitransparent medium. The temperature and light intensity in the material are shown.